Since the first 'Air Steps' in Lindy Hop, the variety of aerials, drops, props, and slides has continued to expand and associated techniques, entries, and exits better understood and defined. Aerials should thus be recognised as a distinct dance discipline in it's own right, not merely a selection of discrete figures that may be simply inserted into the dance as desired once the requisite actions are understood. Even in the simplest aerial, once the feet leave the floor or the body moves toward the floor, there is a degree of risk. Without proper training (not just instruction) aerials are an easy path to injury. Cool Cats FREE Liftwork class provides an introduction to the basic skills and training required to perform aerials safely, with control, and in time to the music. Basic aerials are examined to establish concepts and techniques such as grounding, body lift, body pressure, centre balance, counterbalance, distribution of weight, and through execution movement and momentum. Progressive aerials content and training is undertaken Sunday afternoons at Como. Aerials. Don't just try to throw your dance partner about! Get a feel for how to get things right by checking out our full 'Lifts Focus' series on our YouTube channel (CoolCatsRnR). It's always important to practice through the lifts in isolation before being danced in. Practice may not make perfect, but it will make things a lot safer and easier as you become more confident with the required skills. Some lifts make look simple, but please do not just try these at home! For any man who wanted a challenge, or just enjoys the thought a beautiful woman held on each arm, Triples dancing is the ticket! One guy dancing with two gals at once is one of the iconic images of 50-60's dancing and is even more fun than it looks. Learning to dance as a Triples team is also a brilliant exercise in strengthening and refining Lead/Follow skills. While Triples dancing is possible in many styles of dance, Jive and Rock 'n' Roll are most commonly employed due to the generally simpler structure, leads, and footwork. 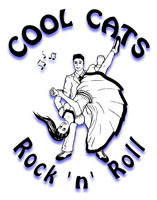 Cool Cats course in Triples provides an introduction to basic figures and the different lead and follow requirements for this form of dancing. Further training in Triples is available through the General Classes, including Aerials or other dance styles such as Rockabilly or 4-Beat. There are many variations on Rock 'n' Roll and Swing dance styles. These include the Continental (European) styles and full variety of 6beat Rock 'n' Roll forms. In addition there are fully integrated fusions of styles (e.g. Swingabilly, Blues/Swing - not simply mixed forms of Swing/Jive/RnR) and specific presentations of certain styles (e.g. Layback Rockabilly) that may be explored. Those who are interested can also pursue performance/showcase dancing, examining story-telling and choreography aspects of their chosen dance style(s).